Located on De La Commune Street in Old Montreal with 1,130 sq. ft. 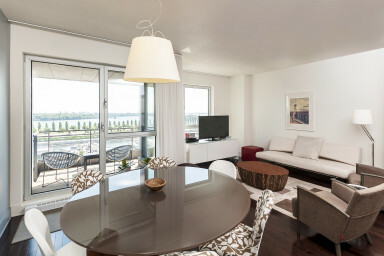 This 2-bed 2-bath condo features gorgeous views, a private balcony, and a modern design. The Solano offers exceptional building amenities including rooftop terrace, swimming pool, and gym. Bright and uncluttered, this 2-bedroom and 2-bathroom condo is fully furnished and ideal for your next short or long term stay in Montreal. Hardwood floors throughout, the open-concept living space features contemporary furnishings as well as fabulous views of the Old Port marina and Clock Tower thanks to floor-to-ceiling fenestration and a private balcony. The kitchen comes fully-equipped with high-end appliances and granite countertops including island block with breakfast stools. Find a queen-size bed in the master bedroom which includes a large walk-in closet and en-suite designer bathroom with soaker tub. The second closed bedroom holds 2 single beds and also offers great storage. Living is made easy with a 6-person dining table, a laundry closet with stackable washer/dryer, as well as a guest bathroom that includes a large walk-in shower and modern finish. Simplissimmo makes renting in Montreal simple! The Solano completed construction in 2013 and is located on Montreal’s coveted waterfront. This massive luxury development, with 6 phases and 124 units, offers a remarkable quality of life in a very unique setting. With some of the finest in the city, the Solano boasts numerous amenities and creature comforts for a truly memorable stay including a peaceful landscaped courtyard garden, a fully-equipped gym, and exercise pool with sauna. Residents will also enjoy the Solano’s rooftop that features a furnished sundeck, an outdoor swimming pool, and a shared lounge that all enjoy stunning panoramic views of the St-Laurence River and the Montreal skyline. Popular amongst tourists and locals alike, Old Montreal’s history and charm are undeniable. The city’s iconic waterfront, known as the Old Port, is famous for its cobblestone streets, horse-drawn carriages, and effervescent Promenade. This vibrant area offers lots of sightseeing as well as year round activities for all ages, such as bike and boat rentals in the summer, and ice skating in the winter. Old Montreal is also rich in upscale restaurants like Club Chasse et Peche and L’Auberge Saint Gabriel, or take advantage of the great nightlife options at places like Velvet nightclub or the trendy Terraces Bonsecours. There are also plenty of services in proximity, and with the Champ-de-Mars metro station nearby, the downtown core is never far away. So if you’re planning your next stay in Montreal and want the best the city has to offer, Old Montreal will not disappoint!